An announcement is made in the heavens that a king will soon be born. The stars anticipate this wondrous event, preparing to shine brightly in celebration. But only the littlest star realizes this baby boy born in such humble and poor circumstances is the long-awaited king. Shining with all the love Little Star can muster, he bathes the baby Jesus in warmth and light. But showing such love and devotion has consequences, and he fades from existence, never to be seen again. 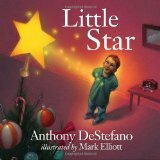 Little Star is a great Christmas story with multiple layers of meaning. It provides a fairy-tale explanation of why the Christmas star was shining so brightly at the time Jesus was born, and is now no longer visible. But it also shows us how important Jesus is in our lives, and that we should never be afraid to give ourselves up in love for him. This littlest star knew who Jesus was, and was determined to let the whole world know. I highly recommend adding Little Star to your annual Christmas reading list.